Important for the future of Charles County and Mattawoman Creek! The WCD curtails sprawl development while conserving Mattawoman Creek and the headwaters of the Port Tobacco River. It will stem increasing property taxes and commute times; it will ensure better schools and enough domestic water that otherwise will run out; and it will conserve cherished rural character. The growth industry testified it could build 17,000 housing units in the WCD. And this number would soar with "bonus densities." The ordinance contains a provision allowing for the creation of lots for family members. However, a last minute amendment to the WCD could open hundreds of acres around the airport to industrial development: county staff was directed to devise an overlay zone for commercial development. While "environmental constraints" were mentioned, it not possible given the extreme environmental sensitivity. What's more, taxpayers would be tapped to provide sewer to an area that market studies find it is not economically sound! The new plan for Charles County's future, adopted in July of 2016, calls for zoning to curtail the sprawl development that is harming Mattawoman Creek and the headwaters of the Port Tobacco River. The Watershed Conservation District implements this zoning. With less new sprawl, this district will do much to sustain the quality of life and rural character cherished by residents. But the development industry is clamoring to thwart the rezoning, saying it wants to build over 17,000 new housing units1 in the district! To further its ends, the development lobby is spreading misinformation to rouse opposition. This is a comprehensive zoning action, a well established means of directing growth and the prerogative of local government. The figure above is based on the comprehensive plan land-use map. The orange boundary marks the Watershed Conservation District (WCD), excluding stream valley to the east.2 Within the WCD, red shows developed areas based on a land-use map by the Maryland Department of Planning. The amount of red helps explain why Mattawoman Creek is at the "tipping point" for irreversible degradation caused by polluted stormwater running off "impervious surface" like parking lots, roofs and roads.3 The development lobby would like to turn the whole WCD red! Nearby woods improves home values. I live in a subdivision. How will this affect me? Beneficially. With fewer housing units being tossed up, home values will be stabilized by less competition. Plus, the assurance of green space tends to raise property values, studies show. In addition, without the new zoning, there would be the huge reservoir of housing units (more than 17,000, according to testimony by a CEO in the real-estate industry) that would add to clogged commuter routes and overcrowded schools. The Planning Commission needs to hear from homeowners and commuters by March 13th! I own a vacant lot of less than twenty acres. Can I build a house? Yes! The draft Zoning Ordinance assures that you can build a house. Do not believe the scare tactics of the developers' lobby. Dark green zoned at densities of 1 unit per 20 acres or lower. The Watershed Conservation District (WCD) has been added for comparison. Source: Maryland Dept. of Planning. Have other counties reduced densities like this? What does reduced density in the WCD do to the value of undeveloped land? Plus, landowners in the Watershed Conservation district will now be eligible to receive funds by transferring development rights through the county's "TDR" program. Moreover, much of the area is slated in the new comprehensive plan to be a Priority Preservation Area, which can open grants for agricultural easements. How much land are we talking about? Much less than the overall size of the district. The WCD represents about 12% of the county area. Once state and county preserved land and easements are accounted for, and land already developed is excluded (red in the map above), less than half the WCD is undeveloped. So less than 20,000 acres are available for development in the WCD. 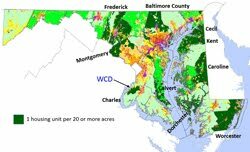 For comparison, Calvert county has over 100,000 acres zoned 1 unit in 20 acres, the same zoning density as the WCD. What are the benefits of the Watershed Conservation District? See the list at the beginning of this article. In addition, Mattawoman Creek has gone from "near to ideal conditions" to the "tipping point" for irreparable decline in the 26 years since most of its watershed was declared an unreasonably large development district (bigger than Baltimore). will protect a recreational centerpiece. 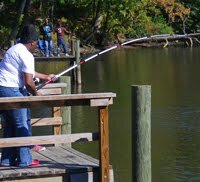 The bass tournaments alone launched from Mattawoman's shores generate commerce comparable to the market value of Charles County's agricultural products. 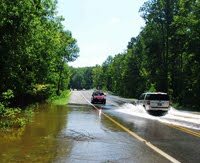 will save millions in natural services: Forests clean the air and water, improve property values, and save millions by providing ecosystem services like stormwater and flood management. Values from the Maryland Dept. of the Environment predict that these services amount to more than $90 million per year in the Watershed Conservation District. will save millions in excess taxes to service sprawl: Houses cost more to service than they generate in taxes. Don't be fooled by arguments about tax base. Sprawl development is one reason why Charles has the highest property rate of all counties in Maryland. How does this affect the naval base at Indian Head? The WCD prevents encroachment! The Naval Support Facility, including Stump Neck, can have its mission impaired by encroaching subdivisions. The Watershed Conservation District alleviates encroachment with reduced densities. -The Joint Land Use Study maps where noise from detonations at Stump Neck is likely to cause complaints.5 The WCD lowers densities in this zone, thus reducing potential opposition to the mission by new residents with no affinity for the base. Prior to the WCD, much of this area was proposed for major subdivisions. - Clogged conditions on Rte 210 are a problem for the transport of energetic materials and for access to D.C. by the Marine Corps' Chemical Biological Incident Response Force, which is charged with responding to an attack on the nation's capital. A navy encroachment study raised concerns about the huge "reservoir" for growth in areas that became the "development district" because new population would clog 210. The WCD reduces the potential to generate new traffic. -When the state ended the proposed Chapman's Landing development, it was acknowledged that this proposal for 4600 housing units was an encroachment threat. The WCD prevents similar huge developments, like Guilford. The WCD improves prospects for revitalizing the town of Indian Head It is widely acknowledged that a run-down town is not helpful to the base's image. The WCD helps reduce competition for investment in the town of Indian Head. 1. Testimony by the Southern Maryland Association of Realtors at a Nov. 28, 2016 hearing on the WCD. 2. A county map of the Watershed Conservation district is here. 3. See the Interagency Task Force Report The Case for Protection of the Watershed Resources of Mattawoman Creek: Recommendations and Management Initiatives to Protect the Mattawoman Ecosystem. 4. A study that included a comparison of Charles County to Calvert County, which had already zoned for lower density. 5. See Figure 30 of the Joint Land-Use Study for a map of noise contours.